Impact Decals does not release decal sets very often, the last one being in late 2011, but when they do, it is a beauty. Typically, this one is for Marine Corps aircraft with most of the subjects being in the 'Pre-Hornet' days, when planes became dull. For this release, they have concentrated on one of the most colorful times in more recent military aviation history, the US Bicentennial. Each unit was encouraged to take one plane and provide a colorful motif for it in celebration. Some turned out much more colorful than others and some of those are on this s heet. Basically there are a pair of Skyhawks, a pair of A-6s and a pair of F-4s. 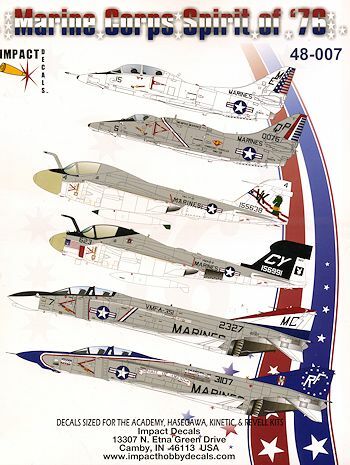 For kits, it is recommended that one get the Hasegawa kit for the A-4s and the recce Phantom. Kinetic for the standard A-6 and Revell for the 'electric' version with Academy for the standard F-4. Of course, there are other kits and it is probable that the majority of markings will fit those, but the ones just listed are the ones for which the markings have been sized. The set includes complete insignia and data markings for all the options. There are wing and fuselage walk areas for the Phantoms and Skyhawks and nose anti-glare panels for the Skyhawks. Areas like that on some of the others will have to come from the donor kit's decals or painted on. All these markings are from 1976 or 1977 as these planes kept these markings for a few years. Starting with the A-4s, we have a TA-4J from VMA-133 at Alameda. This one has the standard international orange wing panels and overall white scheme of a trainer with it's bicentennial markings confined to the rudder with nicely done stripes on the fuel tanks. The sheet also provided pre-1975 tail markings when the nose and fin were also international orange. The other is an A-4E from VMA-124 at Memphis. This one is in light gull grey over white (which is also the base scheme for all the other options). It has a red, white, and blue fuselage band. Moving to the Grumman stuff is an A-6E from VMA(AW)-121 at Iwakuni. This is an early E without the TRAM pod and a buff radome. The tail n this one is all white with the flag motif running behing the tail codes and unit badge. The drop tanks have maintained the green tip and fin. The EA-6A from VMAQ-2 det C is also from iwakuni. It has limited itself to a flag on the left nose. This option will require the modeler to paint the tail and canopy surrount in black. Next up are the Phabulous Phantoms. 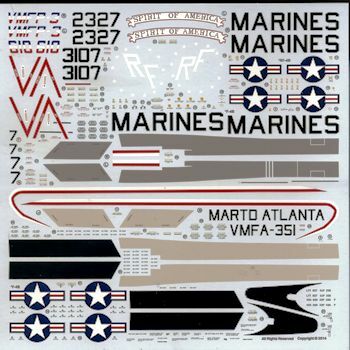 The first option with its red, white, and blue flash fin is from VMFA-351, a rather short lived unit at Atlanta. This one also has a tri-color intake stripe. 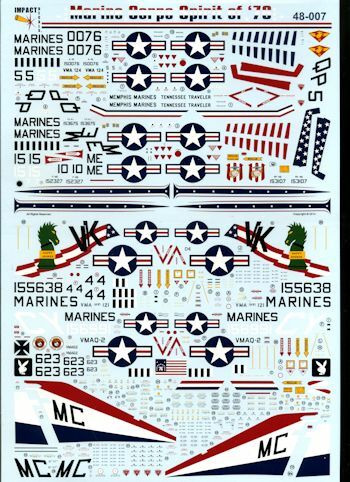 The decal sheet offers the tail codes alone for those who would rather paint the fin, which may well be the cleanest way to go. The other is a VMFP-3 Det 1 plane at Iwakuni. This one will require some paint work from the modeler as the fin and the canopy surround/nose will need to have the blue painted. All the other markings are provided as decals. This is probably the most colorful option on the sheet. The decal sheets are huge with the main sheet measuring 8 x 12 inches and the smaller one about 2/3 that size. They are superbly printed and I noticed no issues with registration. The set comes with full color painting and markings instructions, printed on high quality paper. As a note, I have darkened the smaller sheet to make the white more visible. An excellent sheet which I know you will find to your liking. Review sheet courtesy of ImpactHobbyDecals. Get yours at this link.